I only started growing my own rhubarb a few years ago, but it's well worth it. From a four-foot-square plot, I can get enough rhubarb to last me all year. I freeze it, stew it and even make jam with it. I love to be able to eat my own rhubarb even when there's snow on the ground outside. For the crumble, mix the flour and brown sugar together and rub in the softened butter until you have a sandy, crumbly texture. Add the porridge oats and gently mix. Spread the crumble out on a tray and bake for 20 minutes until golden brown, stirring halfway through. Set aside to cool. For the rhubarb, simply add it to a pot with the caster sugar and the seeds from the vanilla pod – or use a few drops of good quality vanilla extract. Stew the rhubarb by simmering it for about 15 minutes. Allow to cool slightly. Divide the rhubarb between four 8 cm round dishes. 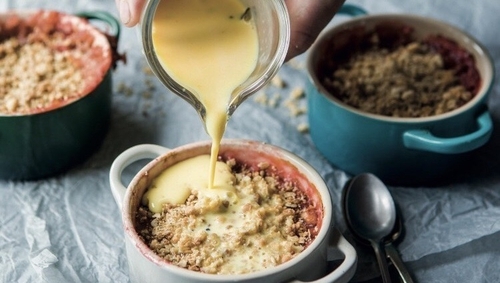 Scatter the crumble on top and place in the oven for 10 minutes. Serve piping hot. Place the milk and cream in a saucepan with vanilla pod seeds and bring to the boil. In a bowl whisk the egg yolks and sugar together until pale in colour. Gradually whisk the heated milk and cream into the egg and sugar mix. Return entire mix to saucepan and cook on medium heat for 6 minutes.